Our buddies Deadly Groove, DP and Lil' Rascal @ Hookah Clan are having us as guests on their bi-weekly show. Come check it out if you're free. When :: Friday, April 6, 2007 @ 9PM US PACIFIC TIME, CONVERT TIME. Wow! I got to be the first to write here. Cool! I'll be downloading this mix when it comes out. IN TRANCE WE TRUST ! It's all bout the E-chEEsE on this one!!! or maybe we should finish that bottle of absinthe? Absinthe!!! Ewie but does its job pretty quick!! Lil green naked men no good!! It actually got me really drunk without seeing things. Maybe I shouldn't have chugged it! Think beers will do too!! well, you are a cosumer! Will the mix be available here to download or at their site? torrents not ready yet, mr D has been very busy lately. Thanks Gt. You're my idol. I've tried downloading the .cue file several times but it seems to be corrupted. Neither Nero 7 Premium nor an MP3 splitter will load the file. woops, try now, cue should be fixed. Posted: Sun Apr 22, 2007 1:06 am Post subject: GT & PC do VT right!!! Hey guys, it was great to have you on the show back on the 6th with a stellar set. Good times!!! thx for having us... and we'll be in vegas may 16-19... a meetup? I'm so down for that bro. Good Times!!! i find that trance is like acupuncture via your ears. it cuts the connection between brain and nerves throughout your body and lets you into an enlightened state where nothing really matters. 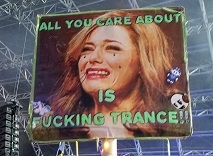 any other comments on the healing properties of trance.